Majestic trees for shade and privacy, rich shrubs for color and scent, manicured hedges for beauty and functionality, they are all the pillars of a thriving property and a healthy environment. Green Leaf is a lawn care and landscaping company specialized in horticulture and landscape architecture, active in Ithaca, Cortland, Syracuse, Binghamton, and the surrounding areas. 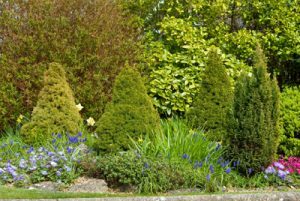 When you care for your trees and shrubs, you know some activities are comfortable and pleasant, while others pose plenty of risks. Green Leaf specialists are here to tell you what they can do for you! 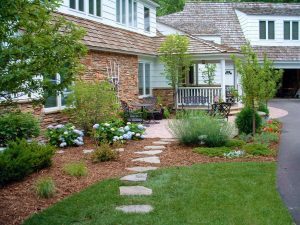 Seasonal tree and shrubs are planting; either you want to build a new landscape on a newly-bought property, revamp the existing one, or merely boost its curb appeal, we have the experience, equipment, and specialists to help you with anything you need. Regular and tailored tree and shrub pruning; contrary to popular belief, tree/shrubs/hedges pruning, trimming, and manicuring is hard Our experts know exactly how to manage all the varieties of woody vegetation you host, when to intervene, and how to tackle potential threats, so your landscape thrives at its maximum of potential. When it comes to tree and shrub care, you cannot have strong roots and rich foliage/flowers in the lack of proper fertilization and weed control interventions. We offer fully customized service in this regard. Tree injections: We have competency certifications and licenses in the application of Hemlock Woolly Adelgid Emerald Ash Borer treatments. We inject trees we keep your trees healthy and safe. Our company carries a competency certification, allowing us to treat trees and shrubs on a rotation cycle to prevent damages caused by pests and diseases. Our treatments follow environmental and sustainability principles. Mulching: we offer specialized mulching services as part of our broader landscape maintenance program and tree and shrub care strategy. Mulch plays numerous roles: it nourishes the soil, protects the roots, fends off pests and wildlife, and add an aesthetic finish to a well-manicured landscape. Sometimes, our clients contract our tree and shrub services separately, but almost all of them include them in a larger yearlong strategy of property maintenance. Our company covers all lawn care and landscaping services, from the basic lawn mowing ones to the more elaborate landscape design and installation. Do you want to get the best tree and shrub care in your area? Contact us, get a free estimate, schedule a visit, and let us turn your landscape into a patch of paradise! We are all trained professionals who continuously study the latest advancements in the industry so you can always benefit from above-standard procedures and functions. Put us to the test today by asking for a free estimate on our tree and shrub care service! Your 100% satisfaction is our company’s primary goal!